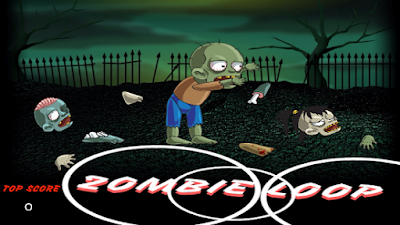 The Zombie Loop arcade game app is perfect for the lovers of the dark side of the mobile entertainment, who seeks new challenging and exciting gameplay to satisfy their needs. In this zombie game you’ll meet the main character, the Zeb Zombie, a wacky friend you use to know and love but has now turned to eating the brains of his victims. In order to win the game and achieve the highest scores you will have to ménage him in the endless running by jumping and weaving around the wheel of doom. - Obstacles that may get bigger? or smaller?